Click to enlarge – or double-click and see all the details. I have two types of hellebore plants in the border garden beside our house, and I’ve blogged about them once before. But that was in late spring, when their colours were more subdued and their carpels (ovaries) were huge with seed. This year I caught them much earlier, before the seeds had started to form. When I knelt down on the patio stones and maneuvered my face and camera underneath the flowers of the purple hellebore (not an easy task, believe me), I was in for a surprise. I hadn’t expected the riot of polka dots and leopard-like spots, nor the intense pink and purple hues – colours reminiscent of the Carnaby Street fashions we loved back in the mid-1960s. Hellebore flowers face down and the plants grow fairly low to the ground, so it’s hard to see what’s going on under those full-skirted petals. Viewed from above, the flowers seem much more subdued than the gaudy floozies that danced above my lens the other day. My knees suffered for the experience, but all the same, I’m glad I took the time for a close inspection. The white hellebore was beautiful too – but much more subdued (click to enlarge). 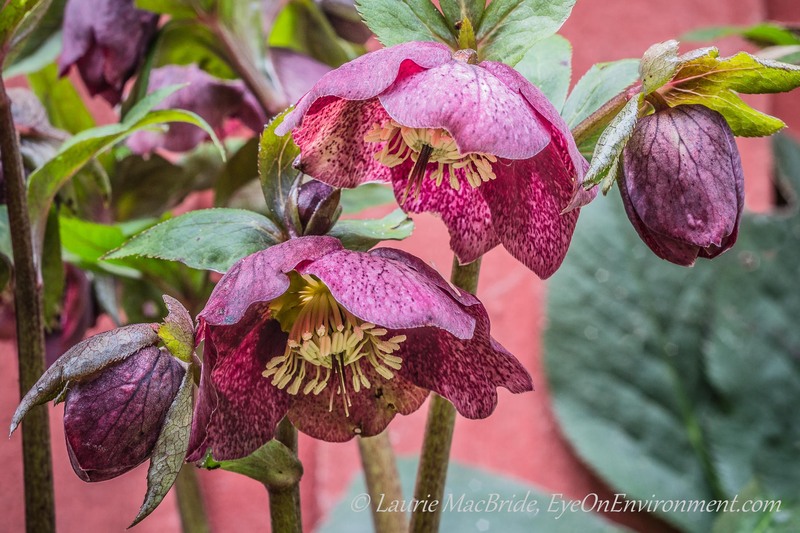 Posted by Laurie MacBride, Eye on Environment on March 15, 2014 in Garden and tagged colours, flowers, gardening, hellebores, nature, photos, plants, spring. What an absolutely amazing set of photographs, Laurie! I had no idea how intricate and beautiful these flowers were, I am very glad you went through those crazy efforts to capture and share these, my friend! Thanks Toad! They seem especially beautiful and intricate in detail this year. Perhaps they liked our cold stretch in February – or perhaps I’m just noticing their beauty more than usual after that weather! Gorgeous hellebores. I don’t see them much in my neck of the woods — thanks for sharing yours! They really are woodland plants, I think – or at least shade lovers – so living in the forest as we do, seems to suit them. Alas, it also suits slugs, who like hellebores too! Those are amazing! Great photos! Ok me thinks somebody got a really good macro lens ??? Your viewpoint has arranged these flowers in all their blooming lovely stages of development. Sorry white hellebore, nice but you have lost the drama contest to your purple / violet siblings. BTW Laurie I have heard that serious Hellebore photographers use good knee and elbow pads. great shots Laurie! i esp. 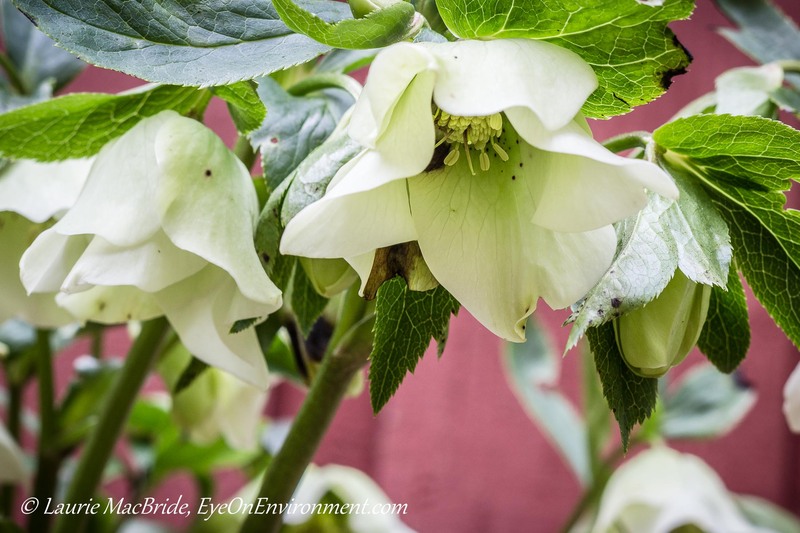 like the white hellebores… i’ve never heard of this flower! ps could you please tell me what camera you use ? and what lense would this be ? Thanks Susan. Nothing fancy in the equipment dept:my camera is a Canon Rebel T3i (or 600D as it’s known in Europe). I have several lenses including a wide zoom and telephoto zoom – but the one I used for these photos (and my current favorite lens) is a prime (non-zoom) lens, a Canon 50mm F/1.8. Very affordable lens and I like its portability. Thanks for visiting and for the comment, Geraldine! They are beautiful flowers, I agree.